We will start the celebration with a Snatra Pooja and a Panch Kalyanak Pooja, under the Guidance of Pujaniya Shri Giriraj Shastriji. For the Aarti, Mangal Divo, and Shanti Kalash, we will have the following Fixed Pledges (Nakaro). AARTI: For the Aarti, we will have fixed pledge of $251.00, and we will have four (4) Aartis. MANGAL DIVO: For Mangal Divo, we will have fixed pledge of $151.00, and we will have four (4) Mangal Diva. SHANTI KALASH: For Shanti Kalash, we will have fixed pledge of $301.00. We will have two (2) Shanti Kalash. About 140 members of the Mahavir Senior Center (from the Bartlett Temple) will join us during our Jain Temple Anniversary Celebration. We will take Two (2) pledges for Aarti, Two (2) pledges for Mangal Divo, and One (1) pledge for Shanti Kalash form the members of the Mahavir Senior Center. 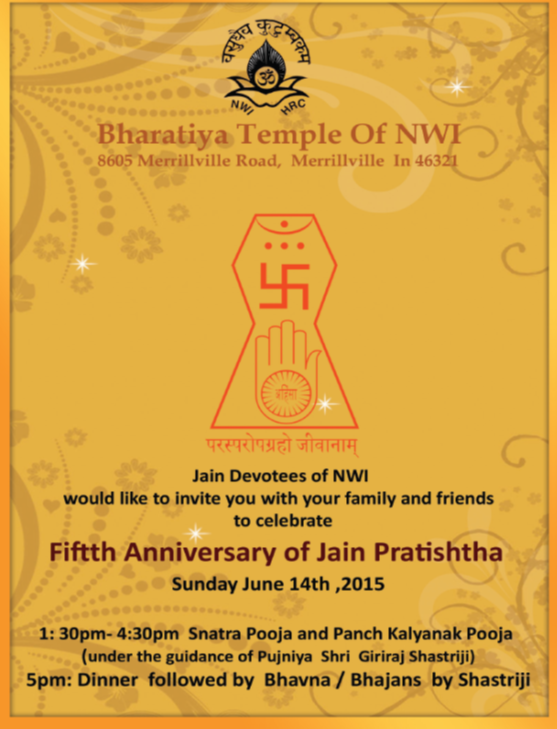 The remaining Two, Two, and One will be reserved for the members of the NW Indiana Jain Community members. We also encourage everyone to contribute generously for the Swamivatsalya expenses. Dinner will be served at 5:00 PM. A Bhavna will follow promptly after the Dinner. Accurate count of the people attending will help us with the management of Dinner. Please review the following Invitation.